1:1,000,000 WGS 84 Imray Passage Chart. 2011 EDITION - Fully updated and modernised throughout. 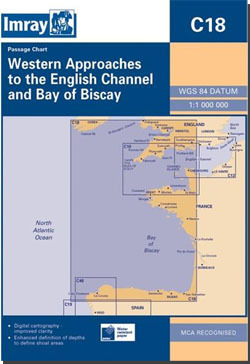 Passage chart of western section of Bay of Biscay, showing Falmouth to Ushant and NW corner of Spain from Gijon to Vigo. Ten-minute gridlines. Scale: 1 : 686.000. Larger scale plans of Approaches to Vigo, and La Coruna. Imray C Series charts cover sailing areas in northwestern Europe. These series form the most comprehensive range of yachtsmen’s charts available. Suitable for passage planning and larger scale charts for navigating the coastal waters even close to shore.